Windows 10 build 14364 comes closer to perfecting the Windows 10 user experience. With the Anniversary Update drawing near, Microsoft is focusing its efforts on fixing the existing bugs rather than incorporating new features, but surprisingly still found the time to develop a new Edge extension. The new Office Online extension for Microsoft Edge allows users to view, edit and create Office files in Microsoft Edge, all without installing the Office package. Using the extension also allows you to quickly access recent files thanks to the OneDrive and OneDrive for Business integration. If you want to use the Office Online extension, you need to upgrade to build 14364; this extension only works on Microsoft Edge preview build 14366 and later. This extension maintains the familiar formatting and layout options to Microsoft’s browser to make it easier for users to easily transition to Office Online. The Office extension has long been available for Google’s Chrome browser, so Microsoft should also add new features in order to differentiate from its Chrome counterpart. One interesting idea would be to add Cortana support to make the Edge version more appealing to users. 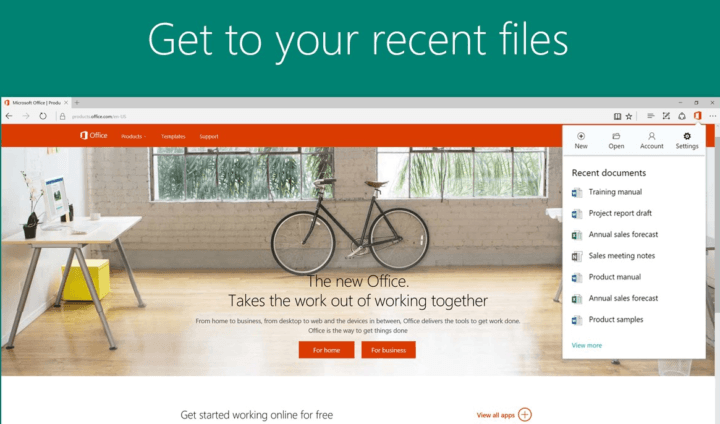 If you’re interested, you can download the Office Online extension from the Windows Store. Microsoft Edge is the most dynamic browser on the market thanks to the many new features and extensions the tech giant constantly rolls out to its favorite and most secure browser. Speaking of the Windows Store, build 14364 also brings some fixes for it as well, including performance improvements to prevent the Store from crashing and using up too many resources on your devices.